Wash potatoes and pat dry with paper towels. Pierce potatoes with a knife tip or fork to allow steam to escape during baking. Preheat oven to 350° F. Place potatoes directly on oven rack and bake for 60 minutes. Check doneness with a fork. (Potatoes are done if potato is soft and fork pierces easily.) Large potatoes may require additional baking time, so plan accordingly. Remove potatoes from oven to covered serving dish. Serve with sour cream, butter, chopped chives, bacon bits, cooked broccoli or your favorite toppings! Easy and tasty variations on everyone's favorite side dish! The humble potato is the perfect companion to a perfectly grilled steak, to sausages when mashed, or as the crowning glory on a shepherd’s or cottage pie. But, there's definitely more than one way to bake a potato. We'll start off by looking at the classic way and then discuss a few twists. 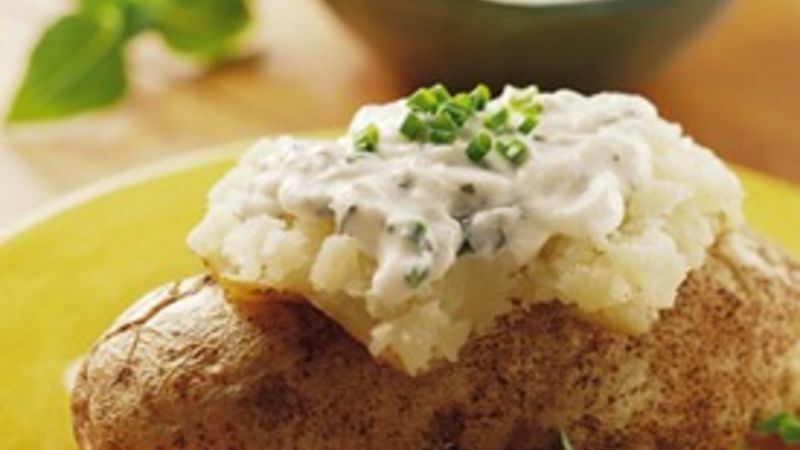 The Classic Baked Potato When served with butter or sour cream, the classic baked potato is wonderful as a snack or as part of a meal. For the most satisfying results, begin by giving your spud a really good scrub. Get the mud off and out of the pores and, while still wet, place your potato on a potato spike (a metal skewer will do) and slip it straight into a hot oven set at 400 degrees Fahrenheit. A fist-sized potato will take about an hour to bake. If you don't want to skewer your potatoes, just placing them on the oven rack to bake works great too. Traditional Roast Potatoes Roasted potatoes are par for the course with any roast meat dish, and they are delicious with the right extra ingredients. Two good potatoes will do for a family of four, so all you need to do is peel and chop each of them into 6-8 pieces (peeling is optional). For best results, preheat 1/4 inch of olive oil in a tray and add 1 teaspoon of fat (beef or pork drippings work well). For leaner potatoes, just use oil. Baste the potatoes before returning the tray to the oven beneath your joint of meat; they'll be done in around 45 minutes. Oven Baked Wedges A good alternative to French fries is the oven version of the classic British chip, easily prepared by cutting your potato into 8-10 wedges and tossing in a bowl with 3 tablespoons of olive oil, a teaspoon of sea salt, a few grinds from your black peppermill, and half a teaspoon of both chili powder and paprika. With the wedges coated in the oil mixture, pour everything into a roasting dish or high sided tray and bake for 30-40 minutes in an oven at around 400 degrees Fahrenheit. Layered Potatoes For more luxurious results, try a potato gratin. After peeling and slicing two or three potatoes, rinse them with water to remove some of the starch and then dry them with paper towels and place in layers in a gratin dish, seasoning each layer with salt and pepper. Mix together a cup of cream with a cup of milk, add a little grated nutmeg and pour over the potatoes, topping with breadcrumbs (optional) and small pieces of butter before cooking for 90 minutes in the top half of an oven at 300 degrees Fahrenheit. Bonfire Spud Finally, the traditional baked potato done al fresco. Although BBQ grills are acceptable for this method (like these delish grilled baked potatoes), bonfires give the best results. To prepare, repeatedly prick the skin of the potato with a fork before wrapping in a couple of sheets of aluminum foil, shiny side in. The trick is to wait until the bonfire is out before using the heat from the embers to bake your potato, finding a safe, memorable place where the potato can be placed and retrieved about 20-30 minutes later.